Brocade introduced its next-generation data center routing solution designed for high-density 10/40/100GbE interfaces and featuring advanced visibility and automation capabilities. 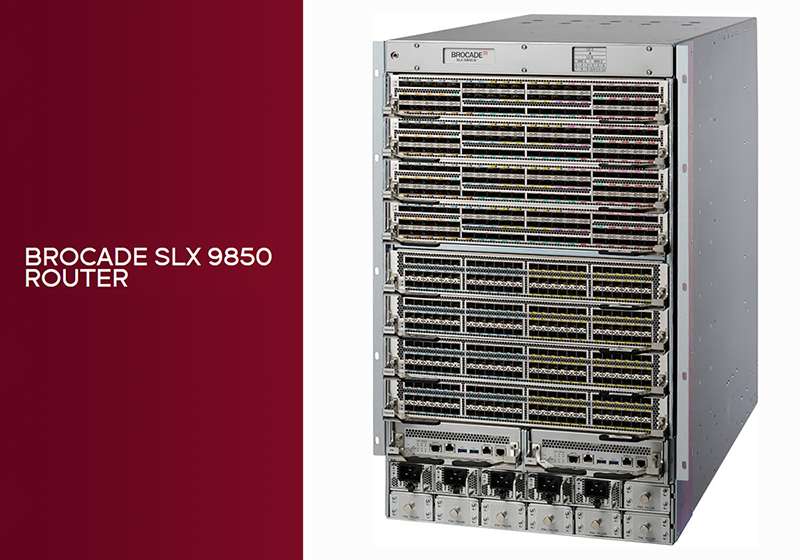 The Brocade SLX 9850 delivers 230 Tbps non-blocking chassis fabric capacity that can support up to four million routes, two million full-color statistics and two million policies. The new router features a unique 1.5 RU modular line card designed for the highest density and scale. It leverages the embedded Brocade SLX Insight Architecture for pervasive network visibility. 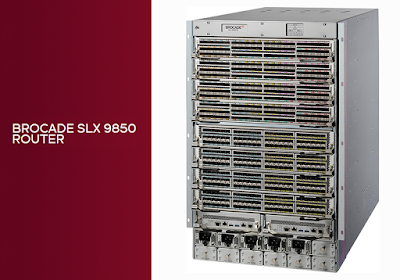 The SLX 9850 also takes advantage of BROCADE WORKFLOW COMPOSER to provide server-based, DevOps-style network automation that integrates across IT domains for end-to-end workflow automation. Commercial deliveries begin in Q4 2016. "Customers tell us that they need networking solutions that not only address their immediate requirements, but that will sustain the next several generations of port speeds and densities, while delivering advanced capabilities to help deeply analyze network traffic as well as automate network operations," said Jason Nolet, senior vice president, Switching, Routing and Analytics Products Group, Brocade. "The Brocade SLX 9850 routing solution was designed to address these needs with an innovative, extensible architecture providing organizations with maximum platform longevity, combined with advancements to deliver unparalleled network visibility and automation." The worldwide Service Provider Edge Router market grew slowly in the first quarter 2015 after a record year in 2014, according to a new report from Dell'Oro Group. During this quarter the Service Provider Core Router market outflanked growth in the Edge for only the second time in five years. "The wild swings that we used to see in Service Provider Edge Router demand have smoothed out somewhat in recent years. This is the fourth consecutive quarter in which we have seen single-digit year-over-year changes in market demand," said Alam Tamboli, Senior Analyst at Dell'Oro Group. "We continue to see Service Providers invest heavily in their mobile backhaul networks and associated routers—some mobile operators are already beginning to upgrade their installed base of routers to higher capacity devices due to increased traffic demand. However, many operators have slowed their spending on routers used for fixed networks, partially offsetting this growth," Tamboli continued. Cisco Systems, Alcatel-Lucent, Juniper Networks, and Huawei Technologies were the market share leaders in the Service Provider Router market segment, accounting for over 92 percent of revenue in 1Q15. Cisco maintained its leadership position, while Alcatel-Lucent, Juniper, and Huawei held, in rank order, the second, third, and fourth spots. 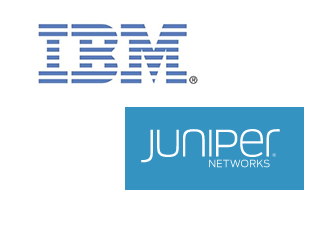 IBM and Juniper Networks are extending their longstanding partnership by announcing plans to provide real-time network analytics to help communications service providers (CSP) and enterprises become more agile and efficient, reducing time to deployment and cost, while enhancing end user application experiences. The companies are designing a new solution in which Juniper Networks' MX Router Service Control Gateway (SCG) will integrate with IBM Now Factory analytics to enable the optimization of network operations, as well as the customization of service experience based on who is using the network and the applications being run, taking into account the device's capabilities and location. "Integrating predictive analytics directly into the stream of data processing – and embedding it into the network of CSPs – will help to ensure the reliability of the network and improve customer engagement," said Bob Picciano, Senior Vice President, IBM Analytics. "Juniper Networks' focus on cloud-based analytics complements IBM's strategy to apply analytics capabilities to help organizations sense, predict and respond to opportunities." The combination of Juniper Networks MX Router SCG, Juniper Contrail and IBM Now Factory will allow for complete visibility of subscribers and VPN behaviors, for CSPs to offer scalable automated services based on actual data. Juniper Networks will utilize IBM Analytics capabilities to better understand data flows and self-configure to automatically update and optimize network operations and the subscriber experience whether subscribers are watching videos or using business applications. IBM Analytics capabilities, such as real-time and predictive insights, will also be integrated in Juniper Networks' Cloud Analytic Engine (CAE) and switching solutions to enhance the quality of experience and application performance by predicting and remediating anomalies such as latency before they occur. 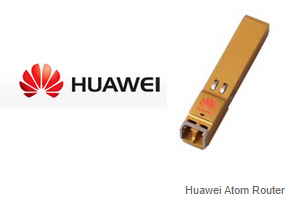 Guangdong Unicom has deployed Huawei's miniature Atom router in its commercial mobile network to support of quality of experience assessments of its customers. Huawei's Atom Router plugs directly into a service port of a device on an existing network, such as a base station, router, or switch, and does not require external power. It provides real-time service level agreement (SLA) measurements and accurate SLA reporting, as well as quick fault location capabilities. The router supports seamless access to 3G/4G mobile bearer networks and smooth OAM capability expansion. Huawei said its solution delivers super-high precision IP Flow Performance Measurement (FPM). It monitors network KPIs to illustrate service quality including measuring packet loss rate and delay of end-to-end service packets transmitted on an IP network to determine network performance. 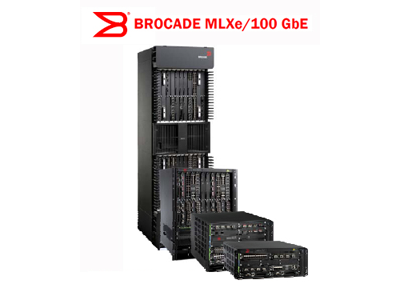 Brocade introduced native port-based encryption functionality for its family of MLXe modular routers. The new security functionality added to the Brocade MLXe routers includes both 256-bit IPsec encryption and 128-bit MACsec encryption for ensuring end-to-end data protection. Both of these security protocols can be enabled at wire speed for up to 44 Gbps (IPsec) or 200 Gbps (MACsec) throughput per module, meeting the highest levels of network performance requirements. The encryption is interoperable with third-party IPsec Suite B-capable platforms, and it complements MACsec functionality available in the Brocade ICX family of switches. Brocade said this update eliminates the need for expensive specialized switch/router encryption services blades or third-party security appliances, while also eradicating performance-inhibiting latency and complex operations that are inherent with these types of add-on devices. Adding encryption and decryption natively to the I/O modules of the router enables the network to ensure the privacy of all data that moves across it, without compromise, for the first time. By bringing wire-speed encryption into the router, customers can enable pervasive data privacy across their New IP initiatives while offloading their appliances, improving performance, and increasing their overall IT security profile. IPsec interoperability with the Brocade Vyatta vRouter is targeted for a future release. "With data breaches making headlines around the world, securing confidential information is top of mind for every organization. As customers tackle the data privacy challenge, they need security everywhere in their infrastructure, but especially for data-in-flight over the WAN. Historically, performance and cost have been key barriers to broad adoption of network encryption technology," said Jason Nolet, senior vice president Switching, Routing, and Analytics Products, at Brocade. "By utilizing innovative, I/O-based encryption in Brocade MLXe routers, organizations can now deploy up to 44 Gbps of wire-speed IPsec encryption per trunk and over 1 Tbps per router, achieving five times the performance at a third of the cost -- and without the operational complexity -- of comparable solutions." "In a recent survey of IT professionals across North America, respondents stated they experienced a 75 percent decline in network performance when security appliance capabilities are enabled such as firewall, anti-virus, deep packet inspection, and encryption," said Zeus Kerravala, founder, ZK Research. "Additionally, 44 percent cited trade-offs being required between network performance and security, with nearly 40 percent of respondents stating they either decline to enable, or completely turn off, functions in their security devices to avoid impacting networking performance." 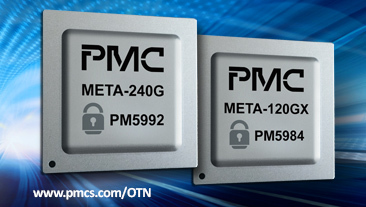 Hardware modules that support up to 200 Gbps of wire-speed MACsec encryption are priced starting at $90,000. A module that supports both IPsec and MACsec at up to 44 Gbps wire-speed performance is priced at $120,000. 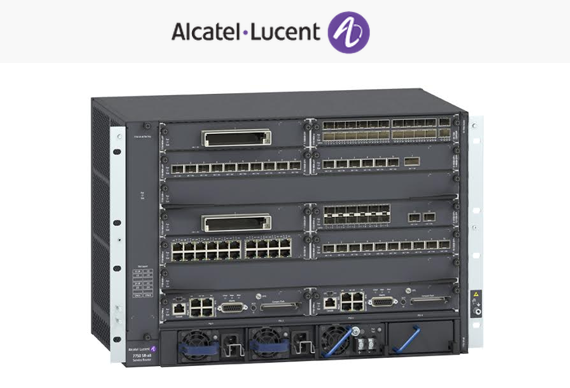 Alcatel-Lucent introduced its 7750 SR-a edge router - a hardware platform designed for high density, high performance aggregation of mobile backhaul, business and residential services. The new platform, which extends the company’s 7750 Service Router family and leverages the company's FP3 400G Network Processor, targets fixed, mobile and cable operators, governments and enterprises. 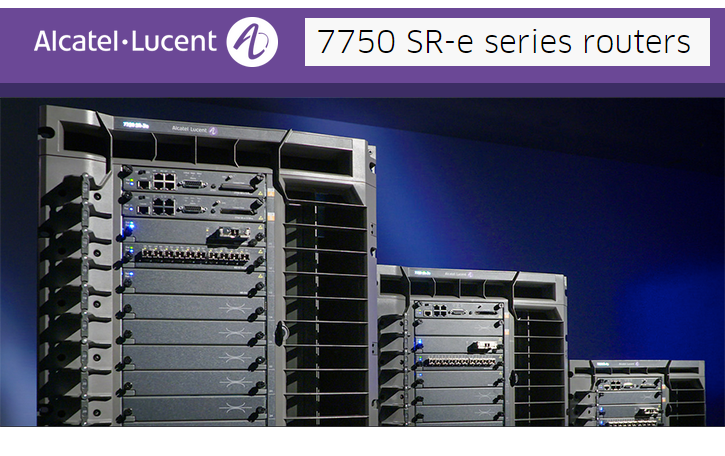 The 7750 SR-a is powered by Alcatel-Lucent’s Service Router Operating System (SR OS) and managed by the 5620 Service Aware Manager (5620 SAM). It offers class-leading GE and 10GE density with high-performance 40G and 100GE interface investment protection. Oversubscription allows providers to efficiently and cost-effectively support the changing traffic demands of a mix of customers - LTE Advanced and small cell mobile backhaul, business VPN, datacenter and cloud-based services and residential broadband services. “We are committed to delivering product innovations that bridge a gap in the market. The 7750 SR-a will allow providers to go closer to the customer to meet their exploding traffic demands across the network. Despite its compact size, by leveraging the FP3 network processor we are not compromising on scalability, functionality or quality of service – it offers performance beyond its size and drives down costs at the same time,” stated Basil Alwan, President of Alcatel-Lucent’s IP Routing & Transport business line. 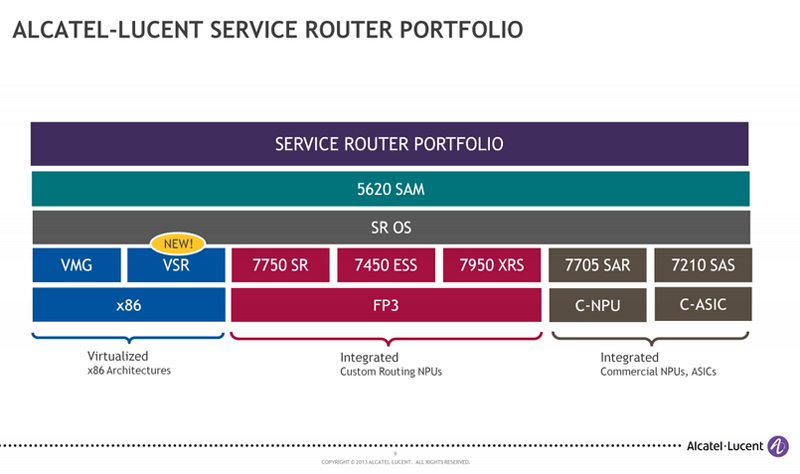 Last week, Alcatel-Lucent unveiled a Virtualized Service Router (VSR) built on Intel silicon and implementing its Service Router Operator System (SROS) and managed by the 5620 Service Aware Manager (SAM). The addition of an Alcatel-Lucent virtualized edge router running on x86 accelerates the industry's shift to network functions virtualization (NFV), enabling service providers to build more flexible infrastructure that scales with cloud technologies. Over 20 trials are underway with carriers and two contracts have already been won. The virtualized router is positioned as an addition to the company’s routing hardware family. 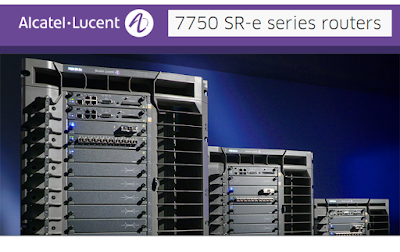 Alcatel-Lucent continues to develop its custom ASICs for powering the higher performance routers. 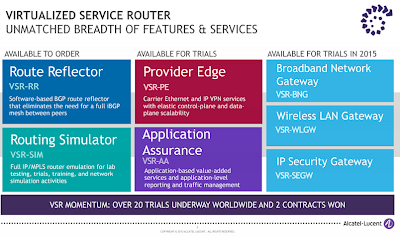 Alcatel-Lucent's Virtualized Service Router (VSR) will implement its full, non-stop routing code. Significantly, the company said it was able to optimize the code so as to deliver 2X the routing performance compared to other virtual routers on x86. The performance gains are achieved by leveraging parallel processing across multiple core on Intel's Xeon processors. Alcatel-Lucent has a development partnership with Intel. In data plane performance, the VSR is able to hit 160G throughput in a 2RU x86 server. In addition, while others have focused on delivering one or two router virtual network functions, Alcatel-Lucent will deliver a suite of router applications. One of the first applications is a Virtualized Route Reflector, which the company says has achieved 8x the performance in the control plane over competitor offers. VSR-RR: The industry’s highest performance virtualized Route Reflector. Available now. VSR-SIM: The full IP-MPLS software-based router simulator. Available now. 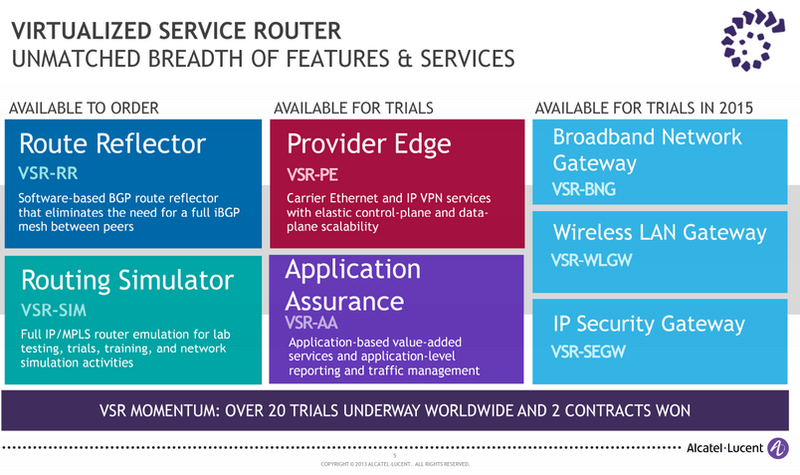 VSR-PE: The Virtualized Provider Edge delivering Carrier Ethernet and IPN services. Available for demonstration now and commercially available during the first half of 2015. VSR-AA: The Virtualized Application Assurance delivers application-based value added services and application-level reporting and traffic management. Available for demonstration now and commercially available during the first half of 2015. VSR-SEGW: The Virtualized IP Security Gateway will be available for demonstration during the first half of 2015. VSR-WLGW: The Virtualized Wireless LAN Gateway will be available for demonstration during the second half of 2015. VSR-BNG: The Virtualized Broadband Network Gateway will be available for demonstration during the second half of 2015. Algeria Telecom has chosen Ericsson to upgrade its broadband aggregation network. 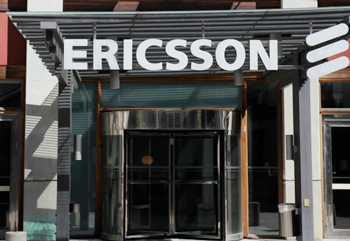 Under the deal, Ericsson will consolidate the existing network using its SSR 8000 platform with Provider Edge (PE) and BNG functionality. The network will support residential broadband connectivity and IPTV as well as high-speed virtual private network (VPN) services for enterprise customers. The agreement includes Broadband Network Gateways (BNG) and Provider Edge (PE) applications based on the Ericsson SSR 8000 family and professional services such as project management, solution architecture, deployment and migration services. Financial terms were not disclosed. ZTE has been awarded 30.77% of China Mobile Group’s annual tender for high-performance routers, the second-highest allocation among all vendors. 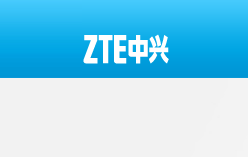 ZTE confirmed that its ZXR10 M6000-S broadband multi-service gateway will now be qualified for deployment in China Mobile’s networks supporting 4G LTE, IP MAN networks, internet data centers, and enterprise-class services. China Mobile’s 2014-15 tender for high-performance routers and switches drew bids from 13 vendors, including ZTE, Cisco and Juniper Networks. ZTE was selected by China Mobile in router categories including P, PE, SR and CE. DE-CIX has upgraded its flagship Apollon Internet exchange in Frankfurt with Alcatel-Lucent's 7950 XRS-40 routing systems. The XRS-40 system combines two XRS-20 chassis back-to-back. One XRS-40 currently delivers up to 160 x 100 Gigabit Ethernet (GE) ports or 1600 x 10 GE ports. DE-CIX deployed the first XRS-40 system on October 1, 2014, and will expand this setup to multiple data centers in the Frankfurt metropolitan area. DE-CIX said this deployment enable it to aggregate more customers on a single edge router and to keep Internet exchange (IX) traffic local within the data center. It will also reduce the amount of traffic that needs to be routed through the Apollon core nodes, which are based on XRS-20 platforms, keeping latency low and data flow manageable in a marketplace that is growing rapidly. Alcatel-Lucent confirmed that this installation by DE-CIX is the first deployment of the XRS-40 outside of North America . DE-CIX has already added more than 80 new customers to its Apollon platform this year, with the number of exchange customers and ports growing. In December 2013, DE-CIX, which operates the world’s largest Internet exchange in Frankfurt am Main (Germany), completed a major upgrade to its flagship DE-CIX Apollon platform and successfully migrated all of its nearly 600 customers to the next system. DE-CIX Apollon consists of four fully implemented Supernodes and six edge nodes spread across the Frankfurt metro, with the platform’s deployment having begun in April 2013. In ten scheduled maintenance windows, 580 customers with a total of 928 ports were successfully migrated to the new DE-CIX Apollon platform. 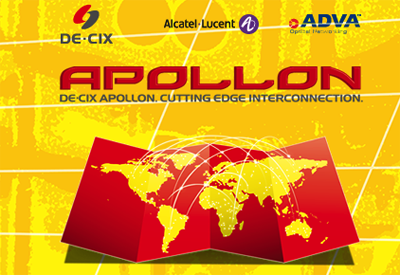 DE-CIX Apollon uses ADVA Optical Networking and Alcatel-Lucent as its technology vendors. Specifically, the platform leverages ADVA Optical Networking's flagship FSP 3000 platform for optical transport capacity of up to 2 Terabits/sec per fiber pair. The switching layer is powered by Alcatel-Lucent's Core Router 7950 XRS, which supports port density of up to 80 100 Gigabit Ethernet ports per chassis. The core of the DE-CIX Apollon network is based on four supernodes that are built from the Alcatel-Lucent 7950 XRS and which are fed by customer-facing switches, both located at secure locations spread throughout the Frankfurt metro. 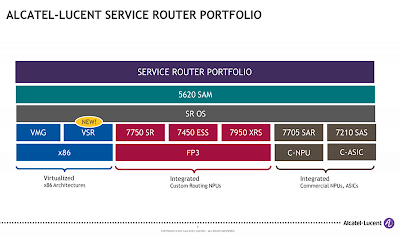 The Service Provider Edge Router market grew to its highest level ever, gaining four percent in the second quarter of 2014 versus the year-ago period, and contributing to a record quarter for the Service Provider Router market overall, according to a new report published by Dell’Oro Group. #1 Cisco Systems: Remained the first-ranked vendor with increased revenue into EMEA and Asia. #2 Alcatel-Lucent: Achieved record Service Provider Edge Router sales, increasing revenue in every major region. #3 Juniper Networks: Delivered a record quarter in Edge Router revenues driven primarily by sales into North America. #4 Huawei Technologies: Saw a shift in demand as Service Providers in its domestic market, China, focused on mobile backhaul and cut back on routers for fiber deployments. “Demand drivers varied by country as all regions grew versus last year,” said Alam Tamboli, Senior Analyst at Dell’Oro Group. “In the United States, demand for routers in the backhaul for LTE networks has been one of the primary motives for investment in recent years, however this quarter service providers in the region also invested heavily into fixed networks. In much of the world, routers used for LTE mobile backhaul networks continued to drive investment in the edge,” Tamboli added. Core router product upgrades with higher speed ports and an increase in traffic in the metro will drive the worldwide Service Provider Core Router market to over $3.4 billion by 2018, according to a new report from Dell'Oro Group. With continued growth in IP traffic demand, many Service Providers are coming closer to exhausting Internet backbone capacity and scalability on their aging core router platforms. With recently introduced products that meet these higher capacity needs, Service Providers are likely to perform a product upgrade cycle over the next couple of years after comprehensive testing and trials,” said Alam Tamboli, Business Analyst at Dell’Oro Group. “Furthermore, the growth of traffic in metro area networks is expected to outpace that of traffic in backbone networks due to a shift in IP traffic patterns related to content delivery networks and data centers. This shift in patterns has caused many Service Providers to install core routers into their metro networks, effectively increasing the total available market to Service Provider Core Routers,” added Tamboli. Huawei announced a deal with Etisalat Misr, a mobile operator in Egypt, to deploy its NE5000E 400G core router as core nodes for its national IP backbone network (IPBB) in Egypt. Financial terms were not disclosed. 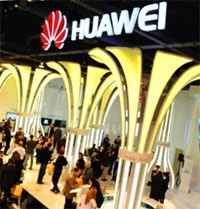 Huawei said Etisalat Misr aims to build a next-generation convergence network platform in Egypt. Huawei's NE5000E 400G solution provides 100G/400G/1T/2T slots that ensure smooth capacity expansion. 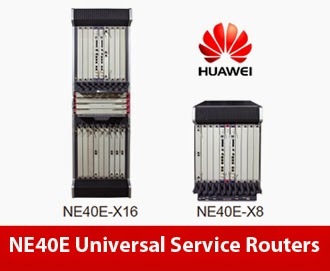 "Huawei will utilize its global commercial deployment experience of 400G core routers to provide Etisalat Misr with a converged backbone network solution that supports multi-service access. Based on the innovative chips and software/hardware platform, Huawei's 400G solution provides a large capacity and enables smooth capacity expansion and low power consumption, empowering operators to reduce TCO while meeting the challenges of future network,” said Zha Jun, president of Huawei Fixed Network Product Line. The Service Provider Core Router market posted a four percent increase in the first quarter of 2014 versus the year-ago period, marking the fourth consecutive quarter of year-over-year growth, according to a new report from Dell'Oro Group. The report forecasts even more rapid growth for this segment through 2014. "Two major factors have driven growth: first, pent up demand due to low investment in 2012; and second, the demand for new higher capacity products," said Alam Tamboli, Senior Analyst at Dell'Oro Group. "The four major vendors in the market have all introduced higher capacity products that make better use of 10 and 100 Gigabit Ethernet ports and many vendors have stepped outside of their traditional flagship core routing products and have introduced products tailored to new use cases in the core," added Tamboli. #1 Cisco Systems: Lost four percentage points of its four-quarter trailing market share versus the year-ago period as revenues grew but the market grew faster. #2 Juniper Networks: Maintained its four-quarter trailing market share above 25% of the market with its trio of products—T, PTX, and MX. #3 Huawei Technologies: Gained two percentage points in four-quarter trailing market share versus the year-ago period, with continued high-exposure to its domestic market, China. #4 Alcatel-Lucent: A relative newcomer to the market gained two percentage points in four-quarter trailing market share versus the year-ago period. NTT Communications is testing Compass-EOS’ r10004 core-grade modular routers in Japan. The Compass-EOS routers are the world’s first direct silicon-to-photonics-based routers. Net One Systems, a leading systems integrator in Japan, is supporting the project. “NTT Communications recognizes that high router power consumption and the resulting cooling requirements, along with the large physical equipment footprint, are turning into serious problems as data requirements grow due to the popularity of smart devices and the use of video applications. 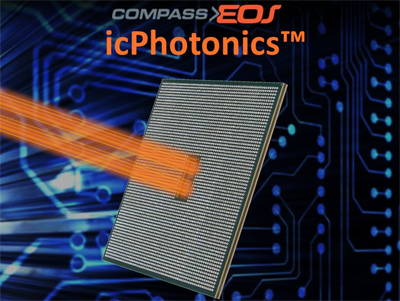 The innovation brought by Compass-EOS’ icPhotonics disrupts the routing industry and frees it from the power-hungry and large footprint routers that have dominated it. NTT Communications will start a practical test of the innovative technology with the help of Net One Systems and tackle the increase of network capacity while reducing power consumption and equipment footprint,” said Taku Morinobu, Director Technology Network Service at NTT Communications Corporation. Last year, Compass-EOS announced that NTT Communications had selected its r10004 core-grade modular routers for use in its high-capacity transpacific network. The demand for routers in mobile backhaul networks is expected to propel the worldwide Service Provider Router market to almost $9 billion by 2018, according to a new report from Dell'Oro Group. “As LTE networks are being deployed in China and across Europe, router demand in mobile backhaul networks is taking off, with service providers expanding capacity to handle data traffic generated by LTE users,” said Alam Tamboli, Business Analyst at Dell’Oro Group. “In North America, we witnessed a rapid deployment cycle, whereas in the case of Europe, we expect the cycle to be longer due to differences in the competitive landscape and a larger population size,” added Tamboli. As of the beginning of 2014, Huawei claims that 53 operators worldwide have deployed its 400G core router over the past five months. Huawei NE5000E boasts a capacity of up to 2 Tbps per slot, 6.4 Tbps per chassis, and 32 Tbps per system. In August 2013, Huawei deployed a 400G IP backbone network for Mobily in Saudi Arabia, and upgraded IP backbone networks for True and DTAC in Thailand. In October 2013, Russian operator MegaFon and Huawei rolled out Europe's first 400G backbone network. In November 2013, Spain’s fixed network operator Jazztel took the lead in deploying Huawei's 400G solution in Western Europe. After almost two years of year-over-year declines, the Service Provider Core Router market grew by seven percent in the third quarter of 2013 versus the year-ago period, according to a new report by Dell'Oro Group. “All major core routing vendors have recently introduced, or will soon introduce new core routing platforms with significantly increased capacity,” said Alam Tamboli, Business Analyst at Dell’Oro Group. “We expect the confluence of these new products to drive the core router market to double-digit growth for the full-year 2014 as service providers qualify these new products for their networks,” added Tamboli. #1 Cisco -- remained the number-one ranked vendor and has introduced two new core routing platforms during the past six months. #2 Juniper -- new product offerings gave the company a more complete core router product portfolio and spurred year-over-year growth in the third quarter. #3 Huawei -- contract wins to provide its new higher capacity router to both domestic Chinese and international service providers drove year-over-year growth. #4 Alcatel-Lucent -- held fourth place with sales of its first core routing product. The University of Florida is deploying Brocade MLXe Core Routers with 100 Gigabit Ethernet (GbE) blades and Brocade ICX Switches in its core network connecting the institution's HiPerGator supercomputer and external research networks, such as Internet2. In the newly opened data center, the University of Florida consolidated three primary Campus Research Network (CRN) sites to two, resulting in a 200 GbE triangle configuration connection between the two sites and the gateway to Internet2. "All high-energy physics researchers in the southeast United States use the University of Florida's network as a resource and all of the data flows through Brocade routers," said Erik Deumens, Ph.D., Director of Research Computing at the University of Florida. "The 100 GbE Brocade MLXe routers enable us to keep up with demands and are also what the campus needed to develop a clear technology roadmap supportive of software-defined networking (SDN)." In addition to the 100 GbE network, the University of Florida is participating in an early field trial of the recently announced Brocade MLXe 40 GbE module and connecting the Brocade MLXe Core Routers with high-density Brocade ICX 6650 Switches that provide 40/10 GbE performance. Brocade said the resulting solution positions the university as a leading example of a campus deploying an SDN-ready 100 GbE network core with 40 GbE connectivity to the aggregation layer.